Learn about the temperament and personality of the Scottish Terrier. Discover what he's like to live with, his traits and characteristics and how he generally behaves. And look at lots of Scottish Terrier photos. 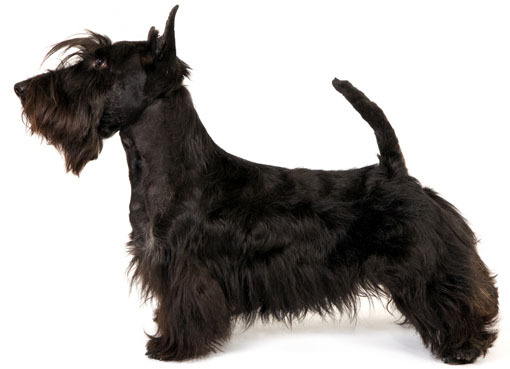 The Scottish Terrier is a lot of personality in a little body: brave, curious, feisty, and opinionated. He's the only breed to live in the White House three times. Before they got into politics, these spirited dogs were bred to hunt and kill vermin on farms. Today they still possess a strong chase instinct and they still love to dig. They also love to chew and will ingest dangerous things that require surgery to remove. So a "Scottie" parent has to supervise those infamous Scottie teeth closely! Also, be aware that a bored Scottie will chew your entire house. The Scottish Terrier is lightning fast and will run away if he can. This breed does best with a fenced-in yard, and invisible fences do nothing to deter this dog if he sees a squirrel he must have. They are an active breed and they love to play outside. They need moderate amounts of exercise and make ideal walking companions. They cannot swim, and if you have a pool, you will have to take care to keep your Scottie away from it. They make great watchdogs and will be sure to announce an approaching stranger. They will also announce an approaching squirrel or passing bicycle. They love to lie on the back of the couch and stare out the window, occasionally barking at things that interest them. They are aloof with strangers and can show aggression to strangers they deem suspicious, and this can include young children. They can be agitated by the quick movements and unexpected noises of toddlers and Scotties can be nippy. Sometimes they think it is a game to chase toddlers and knock them down. They do much better in a home with older children, and you will need to be cautious if young children come to visit. They can be aggressive toward other dogs, but can usually learn to live with a cat. (Just be aware that he might give chase.) Scotties are independent thinkers and don't take naturally to obedience training. They enjoy a reputation of being stubborn. If you ask them to do something, they will always want to know what's in it for them. They excel at agility! Consistent obedience training is very important for this breed. If you do not establish yourself as the pack leader, your Scottie will. But it's all worth it in the end, to have a gentle, loving, loyal, intelligent, protective, sensitive companion. A dog who will want to watch TV with you and sleep in your bed! The Scottish Terrier is harder to train than most other dog breeds. He learns new commands more slowly than the majority of other breeds. You will need to be extra patient when Training him. The Scottish Terrier sheds practically no hair at all. You'll virtually never find a hair in your home!